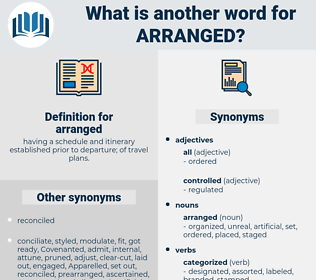 What is another word for arranged? having a schedule and itinerary established prior to departure; of travel plans. arrangements, organise, Managed, Negotiated, engaged, guaranteed, initiated, deployment, prepared, ascertained, coordinated, charged, Envisaged, earned, agreed, finalized, acknowledged, Undertook, Waged, co-organized, staged, organisation, assembled, organization, Convened, Organizations, determined, Enacted, reassured, Procured, implemented, assured, established, approximately, Regarded, Grabbed, Contemplated, Steered, ensured, instructed, insured, acquired, Obtained, entrusted, granted, facilitated, conferred, Participated, anticipated, Inspected, Began, brokered, Gained, handled, advertised, Caught, Collated, verified, secured, Wrote, Enabled, Created, sponsored, present, Presenting, classified, Introduced, Delivered, Enjoyed, projection, structured, allocated, Summoned, addressed, ready, Encompassed, recognized, graded, concluded, paved, ordered, conducted, Brought, defined, redeployed, Deployed, Stipulated, Reached, Ascended, Drafted, constituted, equipped, estimated, Proceeded, seized, attended, planned, planning, Referred, ranked, disposed, Incurred, edited, specified, Offered, Cared, cleared, laid, briefed, derived, Earmarked, held, Wondered, developed, predicted, Operated, fixed, decided, assumed, Convoked, accessed, Captured, forecast, forecasted, monitored, Carried, allotted, Installed, Demanded, graduated, received, Performed, sought, covered, Discussed, Worked, placed, submit, left, permit, permitted, attained, scheduled, Schedules, moved, commissioned, qualified, curated, produced, intended, Toured, Helped, prepped, pursuant, led, improved, featured, Tackled, pursued, imposed, Asked, Concurred, Scored, Instituted, Launched, Mapped, rule, ruled, formed, Climbed, headed, burned, directed, built, figured, Filed, Succeeded, Caused, mandated, noticed, Dealt, Rode, set, Served, affixed, Strove, Questioned, co-hosted, Achieved, struck, Picked, requested, Consisted, Stood, Provided, owed, turned, host, hosted, Ran, expected, attached, decreed, packed, processed, Passed, planted, pointed, plotted, luck, Promoted, required, mount, projected, Took, Stowed, Yielded, Tasked, Fielded, Resulted, Viewed, Gave, mounted, Threw, Awarded, Claimed, Had, Allowed, licence, effected, saw, Fitted, Visited, called, Fronted, put, booked, applied, won, stuck, Meant, Watched, listed, Classed, Jumped, pulled, Looked, founded, Went, Got, closed, Acted, thought, focused, Did, made, organised. 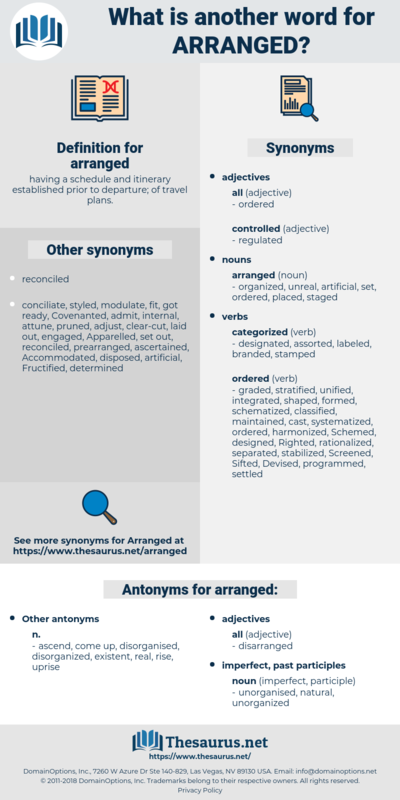 arrangements, Managed, Negotiated, Generated, gathered, engaged, guaranteed, encouraged, governed, reorganized, differentiated, Inaugurated, preparations, categorized, reorganised, merged, initiated, institutionalized, prepared, ascertained, coordinated, Urged, forged, leveraged, choreographed, charged, regulated, Administered, Envisaged, earned, agreed, geared, finalized, acknowledged, articulated, Bargained, designated, Averaged, amalgamated, Undertaken, Enumerated, regrouped, Arrived, categorised, safeguarded, disaggregated, co-organized, Engineered, assigned, consolidated, organisation, Constructed, regularised, Inserted, realigned, concentrated, Overseen, finalised, assembled, Disseminated, terminated, arrested, characterized, formulated, reconvened, organization, decorated, retained, Ceased, restructured, incorporated, Rendered, Convened, distributed, envisioned, Replicated, co-organised, determined, Enacted, packaged, randomized, characterised, configured, disorganised, reassured, reallocated, Procured, implemented, Devised, consummated, mediated, represented, identified, classification, ventilated, spearheaded, assured, established, rescheduled, harnessed, redistributed, evaluated, Contemplated, Embarked, orgnanized, reconfigured, interrupted, circulated, Steered, ensured, located, instructed, insured, pledged, fabricated, illustrated, acquired, Recruited, Obtained, entrusted, granted, Legislated, Retrieved, nominated, guarded, calibrated, refined, Aggregated, distinguished, analyzed, facilitated, enforced, Assessed, apportioned, collected, formalized, converted, labelled, clarified, restored, appointed, conceived, treated, Detained, repeated, anticipated, Lodged, scattered, discovered, furnished, hired, dispersed, summarized, organizsed, reunited, recovered, Defrayed, obliged, understood, unorganized, proposed, brokered, Gained, handled, composed, Entered, discharged, donated, Caught, concerted, Collated, verified, secured, Enabled, endeavoured, calculated, Transacted, Compiled, presented, archived, Accommodated, premeditated, Erected, Begun, Liquidated, Created, Appeared, co-sponsored, designed, upgraded, shaped, fastened, sponsored, renumbered, resolved, classified, Introduced, Delivered, enrolled, lent, Enjoyed, structured, traced, considered, contracted, allocated, Summoned, inscribed, addressed, settled, interested, subdivided, elaborated, recognized, Mobilized, Disbursed, Afforded, outlined, graded, concluded, Targeted, paved, groomed, ordered, excused, discontinued, conducted, Brought, defined, redeployed, Deployed, Remanded, Attributed, prescribed, Enunciated, sent, relieved, described, Stipulated, separated, Reached, executed, arrayed, partitioned, diversified, Issued, Drafted, constituted, broken, equipped, estimated, Harvested, provisions, connected, seized, accumulated, Borne, Attracted, Escorted, Rated, venue, absorbed, planned, reported, guided, Referred, aligned, ranked, surrendered, landscaped, checked, disposed, ordained, Incurred, customized, edited, tailored, maintained, preserved, drawn, record, recorded, invested, taught, specified, restricted, trained, predisposed, portrayed, Offered, Cared, realised, cleared, painted, laid, proven, Happened, prioritized, expanded, Been, enclosed, derived, Waived, Earmarked, Comprised, held, referenced, Screened, developed, stopped, adjusted, solved, predicted, Operated, fixed, contained, decided, Enshrined, related, Anchored, assumed, witnessed, dispatched, Emplaced, fostered, positioned, framed, accessible, budgeted, traded, Convoked, accessed, Captured, combined, forecast, forecasted, place, monitored, foreseen, Carried, Tabulated, run, realized, Remitted, detected, grouped, allotted, Installed, Demanded, received, divided, accomplished, spread, accepted, Performed, confined, sought, found, Submitted, covered, split, Discussed, showcased, protected, Advocated, Worked, started, opted, placed, Prompted, trapped, depicted, opened, chosen, permitted, attained, Channelled, adapted, scheduled, moved, situated, commissioned, employed, curated, occupied, grown, produced, intended, classifiable, sat, filled, finished, prepped, withheld, led, improved, featured, advanced, Tackled, disclosed, pursued, imposed, obligated, Asked, signed, Occurred, fashioned, Scored, Instituted, Launched, pleased, committed, Mapped, rule, ruled, bound, formed, headed, extended, shared, highlighted, reflected, Relied, directed, destined, associated, collapsed, Ascribed, Prorated, built, figured, Returned, Supplied, ridden, stockpiled, clustered, Filed, Succeeded, Caused, Remedied, Adduced, subsumed, mandated, Evolved, Dealt, Accorded, Striven, utilized, halted, set, appropriated, Served, dismissed, experienced, stored, drilled, affixed, Stationed, admitted, freed, Cantoned, Questioned, Indexed, needed, co-hosted, programmed, Achieved, struck, Picked, Exhibited, requested, embodied, completed, Provided, marked, turned, Pushed, hosted, risen, expected, diffused, tabled, added, attached, fenced, Exercised, Bundled, Exempted, included, packed, serviced, handed, desired, posed, Aimed, satisfied, Slated, spotted, liked, paid, cooked, processed, Passed, forced, planted, pointed, Flown, supposed, taken, Displayed, mistaken, devoted, mixed, Promoted, required, seated, Flagged, Lumped, projected, Talked, coupled, Stowed, given, Yielded, licensed, promised, Tasked, thrown, Followed, Spanned, Resulted, Viewed, vested, loaded, used, fallen, mounted, locked, Awarded, Claimed, Wished, Quoted, Housed, ', seen, driven, Allowed, spaced, batched, effected, Slotted, Pooled, Shown, Sided, Fitted, become, Visited, called, Hoped, wanted, put, booked, applied, inclined, twisted, won, controlled, stuck, Meant, Watched, Boosted, listed, CODED, dropped, Classed, poised, kept, Counted, Subjected, suited, let, limited, gone, Looked, posted, founded, Piloted, Gotten, Shifted, name, Got, closed, ", Acted, thought, focussed, Met, done, made, organised, reserved. ascend, come up, disorganised, disorganized, existent, real, rise, uprise. I arranged for her to be here. Perhaps it might all be arranged.